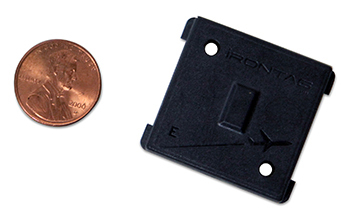 IronTag® 206, the latest product unveiled by HID Global, is a small rugged UHF RFID tag for metallic assets that stands out by its large user memory options and its flame resistant rating, which is the highest available in a UHF tag, according to HID Global. IronTag 206 has an UL 94 V-0 rating that means it immediately self-extinguishes without dripping burning particles that might cause flames to spread when an ignition source standing on it is removed. Furthermore, this RFID tag is waterproof and capable of surviving mechanical stresses, high temperature with peaks up to 220°C for 10 hours, challenging thermal cycling, exposure to corrosive chemicals and prolonged use in outdoor environments. In spite of its small dimensions of just 33 mm x 30 mm x 5.8 mm, IronTag 206 provides excellent on-metal performance with read range up to 2.5 meters and accommodates two holes to be firmly mounted with screws. Leveraging integrated chips of the Impinj® Monza® X family, which are EPC Class 1 Gen 2 compliant and offer large user memory that can be permanently locked after being written, the IronTag 206 is suitable for tracking aircraft parts during assembly and maintenance and other applications that require a rugged UHF RFID tag that must securely store data about the whole history of tracked assets. The first chip option, the Impinj Monza X-2K Dura chip, comes with 2176 bits of user memory, including three 512-bit blocks and one 128-bit block that can be permanently locked. The second option is represented by the Monza X-8K Dura that has 8192 bits of user memory with four 512-bit blocks and twelve 128-bit blocks that can be permanently locked. IronTag 206 is available in versions optimized for E.U. standards (865-868 MHz) or U.S. standards (902-928 MHz). Customization services include high-bond, high-temperature adhesive and alternate embossed logo. Please contact HID Global for additional information on this small and rugged UHF RFID tag with large user memory. Looking for RFID tags for other applications? Try our RFID Tag Search Engine or contact us at info@veryfields.net, also for suggestions about complete RFID solutions.